The ultimate weapon for aggressive offensive players! 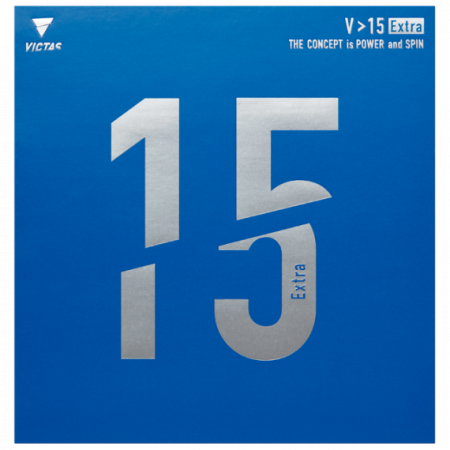 V > 15 Extra is a high-end offensive rubber which will enable you to perform on a new level in topspin rallies. Feel the ultimate power and high-efficiency energy conversion of the innovative 47.5° offensive sponge and experience the unlimited potential of the spin-optimized top rubber sheet! Demanding offensive players who rely on aggressive topspins as well as topspin-to-topspin rallies will take their play to a new level with V > 15 Extra! (^ ^)	（Experience：６〜１０ years）	good! It is very well decided if it is carbon. You can defend it with a block, a block, a robbing, etc., or make a counterattack at all rounds. Serve feels it's a bit difficult to spin, but overall it's still easy to hit the opponent with a single shot. Although I thought that I could not use it with people without power like myself, I bought too much like Niwa. I thought it would be useless without power, but it was easy to use normally because the grip was high. Anyway, the counter was easy to do. Especially the counter for the speed drive was easy. It's easy to do bench technology and it's easy to serve. A result	（Experience：Less than a year）	Easy to use! From the serve to the platform, I felt easy to use in everything from drive inquiries, smashes, counters! A ball that you can hit in a sense goes and you can play it! It has become impossible to draw out the original potential of this rubber. However, I felt that the power of striking strongly was about two steps higher than the stiffness I used before. I think that if you are conscious of striking more strongly at the time of practice you can demonstrate the original strength of this rubber in the competition. It was easiest for the counter to have the highest grip ability in the rubber that I hit so far. Because the serve can be disconnected so much, the other party makes a net mistake. I thought I needed a lot of power to hit back though I was on the fore.